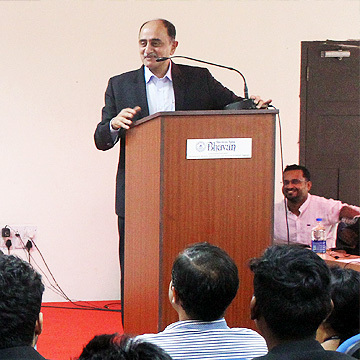 Students in Bhavan's B - School are provided ample occasions to interact with the Corporate Executives. The main objective of corporate interaction is to expose them to the realities of the corporate world. Executives from different industries are invited to share their experience and expertise so that the students will get acclimatized to various industrial cultures and practices. Both practitioners and consultants from the industry are invited. The forum provides students the opportunity to bridge the gap between theory and practice through open discussions and debate with distinguished practitioners. These interactions enable the students to understand the challenges ahead of practicing managers. Mr. Manomohanan, CEO,Muthoot Capital services Ltd.
Mr. John Mathew, Chief Manager-HR, V-Guard Ltd.